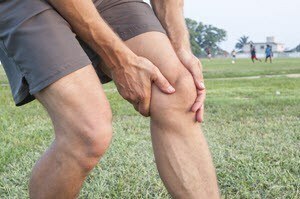 Your knee is a very mobile joint carrying a lot of your body weight every day. As a result, it commonly gives trouble. A very common scenario with the knee is it has a relatively minor injury that makes the muscles behind and around the knee to go tight. This causes the knee to lose it’s ‘swivel’ and it tends to grind instead of swing. This in turn causes pain and irritation that again results in the muscles going tight. And so the cycle continues. By releasing this pattern, it can sometimes be amazing how bad a knee can heal up just fine. Your ankle and feet are at the lower-most point of your body and so carry the most weight of any part. With some 28 bones in that complex arrangement, it’s no wonder it can give trouble. Often the ankle or foot joints can get stuck and an ‘adjustment’ or specific thrusts to those bones can release them and put them back into better alignment. This can give remarkable relief to foot problems.